Two bones make up the lower leg: The tibia and the fibula. The tibia is the larger one and bears most of the body weight. The fibula is the smaller of the two, located on the outside of the leg. Because the fibula is smaller and bears less weight, sometimes you can have a fibula fracture yet still walk on your leg and you might even be able to run. Sometimes shin pain can mean that you have a small fibula fracture. If that happens, see a doctor immediately to help ensure that you do not have a fibula fracture. When you have a bone fracture, most of the time pain is the biggest symptom, as well as deformity of the leg. But with a fibula fracture, things might be a little different. A fibula fracture usually presents with pain in the shin that can be moderate to severe. If blood flow is compromised, your foot might feel numb or cold. If the fracture is severe, you might see a deformity underneath the skin. Other symptoms include tenderness or swelling, bruising of the area and an inability to bear weight on that leg. 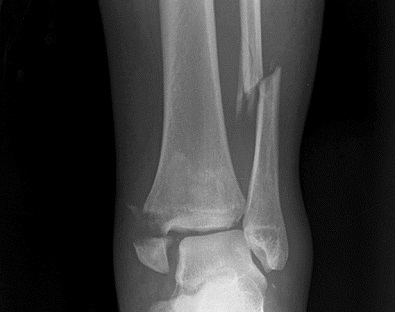 The most common cause of a fibula fracture is a direct hit or trauma to the lower leg. Sometimes a fracture can be caused by stress or a repetitive motion that weakens the bone. Some experience a fracture through twisting, turning or other sudden movements. The doctor will look at your medical history and conditions that might make you more prone to a bone fracture, like previous fractures or surgeries. The doctor will also ask if you have recently experienced trauma, such as sports injuries, vehicle accidents and the like that cause the pain in your shin. The physical exam is an important part of establishing what kind of injury has occurred, how bad the break might be and other contributing factors, such as decreased blood flow. X-rays are the first step to figuring out whether there is a fibula fracture and how bad it is. If the fracture extends to the knee joint, your doctor might recommend you to do an MRI or CT scan to determine the true extent of the injury. These scans might also be necessary to detect a stress fracture in its earliest stages. This procedure aligns the bone without surgery. Then a cast is applied to keep the limb immobile and give it time to heal. You might be able to walk on the leg while it is healing, or you might need to use crutches to avoid putting too much weight on the injured area. This all depends upon your activity level, overall health and doctor’s recommendation. When recovering from a fibula fracture, using Rest, Ice, Compression and Elevation is a great way to treat your condition. This means resting the leg as much as possible, using ice to calm down the swelling and pain, turning to compression bandages to help alleviate the symptoms and elevating your leg on a plane higher than your heart. All of these things go a long way toward making you feel better. Ibuprofen is often recommended for the swelling and pain that accompany this type of fracture. Steroids might also help. A more significant fracture might require other medications, such as serious analgesics or heavy-duty antibiotics. Always take medications as directed by your physician. Serious fractures might require more than a closed reduction. In that case, be ready to accept surgery that will fix your leg immediately, rather than taking a ‘wait and see’ approach. This might also be necessary if you are experiencing other problems from the fracture, such as a reduction in blood flow to your ankle and foot. As the bone heals, some strengthening exercises might be recommended. Once the cast is off, physical therapy is often recommended and must be completed in order to ensure you have the ability to walk normally on the injured leg. Physical therapy can take months, so patience is required. Server responsed at: 04/23/2019 6 a.m.